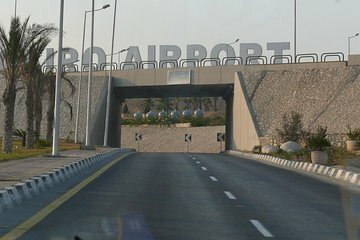 Viaje sin problemas y cómodamente del Aeropuerto Internacional de El Cairo a su hotel en El Cairo o Guiza después de ser recibido en la terminal por un simpático conductor multilingüe, que le acompañará a su monovolumen privado con aire acondicionado y Wi-Fi gratis, donde tendrá botellas de agua, un refresco de bienvenida y aperitivos. Tranfer was ok and in time, the person who recieved us gave us bottled water and help with the luggage. However the inclusions mentioned that the pick up person was going to recieve us before customs for help with visa and others, but the pick up person was waiting for us after costums on the baggage deliver area. Our flight was late and we were so happy to immediately see a man with our name on a sign as soon after disembarking. He assisted with getting the visa, getting through whatever lines, and getting the baggage. It all happened so fast. His English was great and we had a nice ride to the hotel. Exceeded my expectations. Would definitely use this service again. Van was a little run down but we were greeted inside of passport control to explain the entry process and water and wifi were included.